All photographs copyrighted to the author. Please do not use text or photos for any purpose without asking. Since 1852, at a time when the North African Sloughi became more well known to the Western World, the various standards which followed the previous descriptions have been modified. The ear set of the Sloughi is what has seen the most changes in the breed standard. The ears of the Sloughi are required to be larger than the Greyhound's and carried folded back - they are sometimes also half erect. The most famous sculpture of the breed, entitled "Tom, Algerian Sighthound", by the 19th century Animalier Antoine Louis Barye, shows a Sloughi with such an ear set. 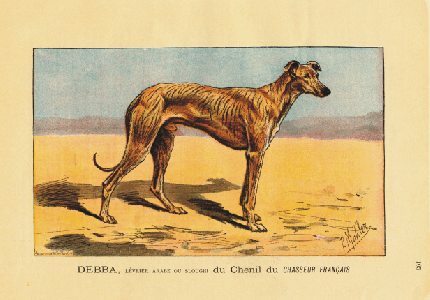 1896, Sloughi "Debba" of the Chasseur Francais journal's kennel. 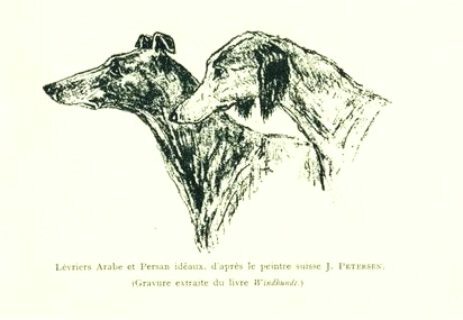 (first published in the book Windhunde) in “Les Races de Chiens” (“The Breeds of Dogs”) by Count Henri de Bylandt, Belgium. Prior to 1973, the Sloughi being the French Sighthound, the Sloughi standard is in the hands of the French. 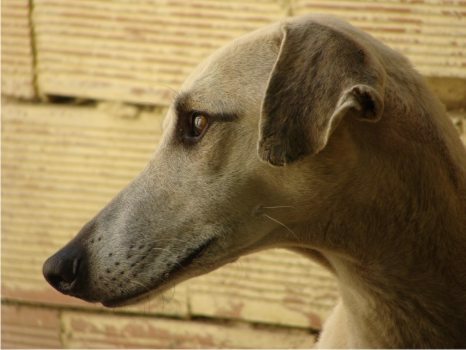 It is in the 1937 standard that the description of the ear set of the Sloughi is changed dramatically from an ear larger than that of the Greyhound and folded back, to that of a lop-ear. At the time the Dutch - the Netherlands was then also an important country for the breed - disagreed. Be it as it may, the Sloughi is now required to have lop-ears. However, many Sloughis still have folded ears, for example when they trot or when they are nervous. As in the past, many Sloughis in North Africa still have folded ears. 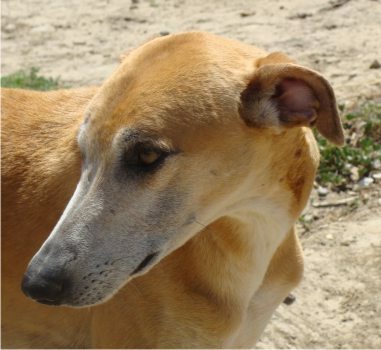 Such an ear set does not imply, as is often mistakengly stated, a crossbreeding to Galgo espanol. Folded ears are simply part of the Sloughi's genetic make-up, even if lop-ears have been imposed on the breed by the standards since 1937. The hunters in North Africa do not always care about the way a Sloughi carries its ears, the hunting talent of the dog being more important, and in some countries the ears are cropped.